Sleestaks are devolved, green humanoids with both reptilian and insectoid features; they have scaly skin with frills around the neck, bulbous unblinking eyes, pincer-like hands, stubby tails, and a single blunt horn on top of the head, and bear a resemblance to the hypothetical "Dinosauroid". Sleestaks often communicate with a hissing sound that rarely changes in characteristics. However, like their Altrusian ancestors, they possess some rudimentary form of telepathy as well. Sleestaks are more sophisticated than Pakuni and are able to manufacture crossbows, rope, nets, periscopes and other relatively advanced technologies. 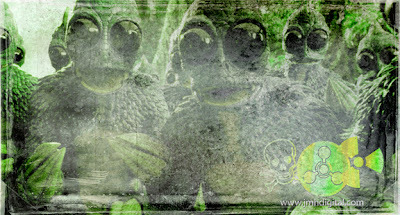 Sleestak are typically equipped with a crossbow and a quiver full of metal bolts which hang from their waist. The Sleestak have a current population of about 7,000 according to the Library of Skulls, but there were only three Sleestak costumes available for the show's production, which sometimes required creative editing to create the illusion that they were that numerous. Damn! A blast from the past! Three costumes does not make for much of an army. I can't believe they actually creeped me out when I was a kid!!!! I loved Land of the Lost!!!!!!! Sleestaks Rule! Tim does Sleestak Sunday, each weekend. Love it.